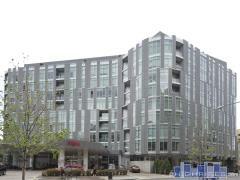 Cheval is a luxury condo building towering over Bethesda. Among the many amenities, residents enjoy and rooftop lounge and bar, fitness center and yoga room, and concierge services. Walk to lunch at Bistro Provence or take in an installation at Bethesda Fine Art. The vibrant neighborhood is walkable and everything from dining, entertainment, fitness, and shopping is within reach. Have any comments or questions about Cheval Bethesda? Ask your question and/or share your thoughts about this Building. Do you have one bedroom or studio condos?